Two instruments designed by Walter Landrieu. Top: rhythm programmer for the tracking of a waveform through a patch bay. 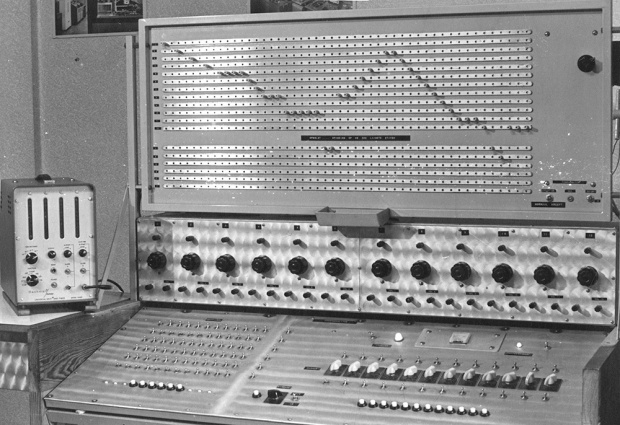 Centre: bank of 12 tone generators, with a choice between different waveforms. Left: frequency meter. Posted on January 13, 2014 Full size 620 × 425Leave a comment on Two instruments designed by Walter Landrieu. Top: rhythm programmer for the tracking of a waveform through a patch bay. Centre: bank of 12 tone generators, with a choice between different waveforms. Left: frequency meter.